What's most impressive about ComiPo is not just how versatile it is but also how easy it is to learn. You can pretty much be up and creating in less than 15 minutes and be completely confident in finding your way around within a few hours. The base product comes with plenty of content to get you started. Plus, once you've registered the software, you get access to nine additional bonus content packs that you can download for no extra cost. You could certainly get by for quite a while on just this content but if you want more character and outfit options then there are additional premium content packs available at very reasonable prices. There's also the ability to import your own backgrounds and props if you don't want to buy extra content or need something specific that just isn't available. All the characters in ComiPo are full 3D models that you can rotate and position almost anyway you want. This makes them excellent for experimenting with character placement to create dynamic compositions within each frame. Unfortunately whilst you can fully manipulate the head and hands into almost any position you can't do the same with the arms, legs, feet or torso. You're stuck with the predefined poses. That said, there are hundreds of poses to choose from. I had no trouble finding just the right poses for my comic strip below, which I created in just a few hours (in between other distractions). My only other major criticism is about many of the backgrounds in all the included content. It's clear many have been drawn with great care and thought for composition in how that might be used. However a vast number of them are obviously photographs with an illustration filter effect applied that not only looks awful but also isn't served by poor composition that leaves little space to place characters. That aside it's a fun, stress free piece of software to use. The included content is clearly targeted at young teens as most of the characters and the higher quality backgrounds are school themed but anyone who loves creating Manga should enjoy ComiPo. Especially if you're more of a writer than an artist. Comics can be output as jpg, png or pdf files for the web or can be printed at high quality if you really want to make a physical comic book. Personally I enjoy using ComiPo. 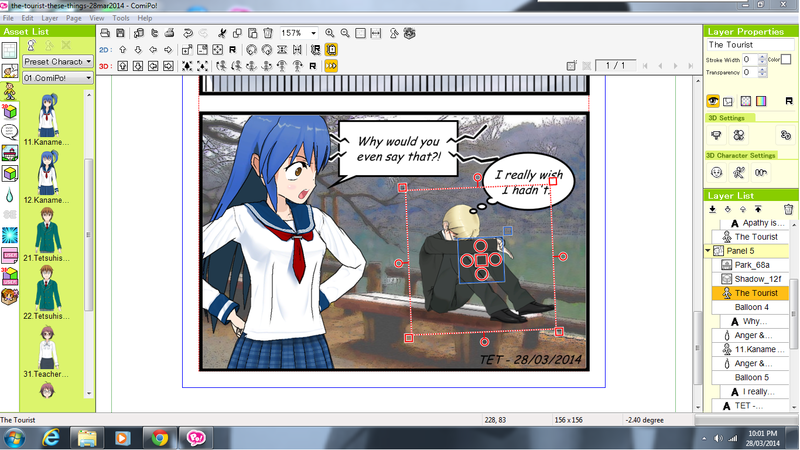 I could easily see creating short Manga strips as becoming my new hobby outside of animation.